Augmentation slot has been removed. This is not tradable on Firiona Vie, for whatever reason. Time to remove the no trade flag. up on my 15th RZ kil and no ton po for me ( rogue ) seen 2 drop tho . monk and another rogue got. As of PoR release, the shuriken no longer have the cool lightsource that lets them also be used as tracers. It was causing problems with the advanced lighting, so to fix, the light effect was disabled. This has an aug slot on it, but is only useable in ammo slot. I thought you can't get stats from the ammo slot -- am I mistaken? EDIT: Turns out the aug slot has been removed. Not to Rare. More like uncommon. 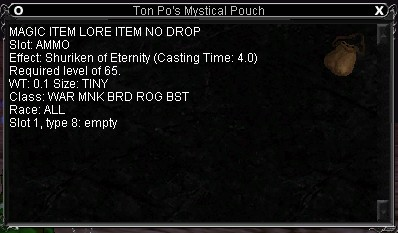 In my guilds 7 clearing's of time we have seen this drop 2 times. I dont consider this common or Rare. As a Monk i would drool profusely over this. The reality though is as a casual player i wont even get close to this LOL. Many power gamers, deserving EQ veterans & probably the power gamers bots will get this long before a casual. Then again, as it sounds it is a too rare drop, so i wish luck to those able to achieve this stage of play. i only wish Sony would make my Bracer of Hammerfal hammers able to hit magical creaures :-( come on Sony help us poorer players out a bit. Does the hp in ammo slot effect your total hp or does it only count the one in the range slot? No stats from ammo slot items. I tried auging my resonance item that is range/ammo. After auging it was flagged as only range. Just a tidbit for those who want to aug ammo slot items. It only affects your hp in the range slot. All the ammo slot will take are skill mods, like from the tradeskill trophies. the pouch can be clicked from your invintory so berserkers can still use it if it drops... but wow, i want one of these for my zerker, but my raid alliance cant get past p4 we kill all of the gods but then they just quit. i dont think we will ever get there. WTF They just stop...they dont come back the next night to do P5 and Quarm? Berserkers can use the No Drop (Trade) shuriken but not the pouch that summons them? I am confused. Is there some other way for the Berserker to get these? Does this pouch useable classes need to be updated? Did Sony do it again? It is clickable from inventory. I do not know if a zerker can do so. Generally you would get the "your class/race/deity cannot use this item" message when you go to click it, even tho its in inventory and not equipped. Any BBards using these while they are chant kiting? and if so how much dmg are they adding? Alot. Throwing damage has a crit multiplier. So when I throw this I hit 164 crits like crazy. SO...as far as bards go, ya got 220 a tick x 4 + 92 from your 1 min dot/slow doing a total of 972 damage a tick. If you can manage to kite backwards you can do a considerable amount of damage just kiting. But the sad truth it this. At this point in the game, after all the monks have their Ton Po's I am already 12k+ hp and in most situations I toe-to-to melee mobs that I used to have to kite lol. BUT on those tougher mobs these shurikens + dots do tons of damage. Heh, I saw a rogue using these and Holy Coy! Can assassinate with them and crit... talk about fast damage. Those are some nifty little stars it summons, so does anyone know who drops this little gem? p.s. guess Allah's doesn't have a link to the actual shuriken it summons but it is on lucy and is quite a beautiful thing. Also does anyone know how many shurikens u get for one summon? Drops off Rallos Zek P-5 in TimeB. good luck getting if youre not a monk or rogue. Are you joking me? I've seen 3 drop. And 0 of them have gone to monks/rogues. /sigh.